Just like in most parts of the world, unfortunately, in Goa road safety by default is meant to make roads safer for cars, not people. This is why a policy is required that prioritises safety of people over that of cars. Interestingly, the Central government had set up the Sunder Committee based on whose recommendation, the Union Cabinet on 15.03.2010 approved National Road Safety Policy. Based on this policy, 29 states and union territories including Dadra & Nagar Haveli, Lakshwadeep and Triura prepared their policy and upload on the MoRTH road safety website. Unfortunately Goa does not feature on this list since it has no comprehensive policy on road safety. Kerala also recognises that “Human beings are prone to make errors due to their physical, mental and driving limitations. Therefore, transportation should be designed to such level of safety so that the scope for human errors is minimized and the harm is reduced when they occur”. 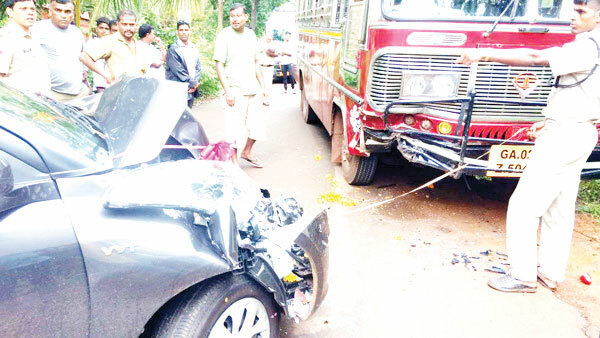 This is a stark contrast to Goa where the onus of an accident lies entirely on the drivers. Neither the PWD nor the Transport department takes any responsibility for bad road conditions, bad road designs, improper sign boards, lack of street lights, lack on white paint over speedbumps and zebra crossing, lack of mitigation of black spots (areas prone to accidents) etc. In the Gujarat Policy, the Government stated that it will take appropriate measures to ensure that the required legal, institutional and financial environment for road safety is further strengthened and a mechanism for effective coordination of various stakeholders is put in place. The Government will consider the scheme to create State Road Safety Fund with the objective of strengthening road safety and implementation of road safety measures , through a loan, grant, funding through central Government or any other sources as authorized by the Government. The government will also ensure to establish Motor Accident Claim Tribunals (MAG) in adequate numbers in respect of a number of cases. The Government will create a lead agency to ensure effective coordination and active and extensive participation of the Government Departments, the community at large, the private sector, academia and NGOs. These are just some of the steps in that articulate the overall vision and commitment of these states towards road safety. Unfortunately, Goa lacks such a vision even though the Directorate of Transport as well as PWD is headed by the same Minister. Inspired by the Delhi Traffic Sentinel scheme, the DGP of Goa implemented the scheme in Goa. The controversial scheme has sharply divided public opinion since it is perceived more and a money making scheme rather than a tool to improve traffic safety. Even if the public ignores the fact that the DGP did not take administrative and financial approval to collect and disburse money under this scheme, which itself warrants an inquiry, the scheme violates the article 14(2) of Constitution of india. The Article states equal protection of law-that means every person will be protected equally. The Traffic Sentinel scheme in its current form cannot be used against vehicles registered outside the state. Presently, there is no mechanism to track the vehicles, which are reported by the sentinels, on the border as the vehicles leaves the State or if these vehicles (bikes and trucks) are transported on railway. If the Motor Vehicle Act is enforced only incase of violations committed by owners of vehicles registered in Goa, this is a violation of Article 14(2) as it give unequal protection to every person. Another problem with the scheme is regarding the employment status of the sentinel. The sentinels are providing a service to the Police department for which they are given monitory compensation. The service is similar to that of a traffic police who reports violations. In such cases, don’t the sentinels deserve the same protection which is given to a traffic police or a Home Guard? The traffic sentinels who were attacked by the public should have been protected under the same laws which protect any other government employee. Captain Viriato Fernandes or Goencho Awaaz says that no one is against the scheme per say but the traffic sentinel scheme as a government policy has been implemented in a haphazard manner and have put people’s lives at risk. “Most of all, it exposes the fact that the Government is not interested in investing in public surveillance probably because during election season, the cameras will monitor the vehicles which go around at night before the elections distributing money.”, he said. As mentioned earlier, the road safety in Goa primarily revolves around safety of vehicles and not people. This is evident from the fact that less than 10% of roads in Goa have footpaths. There are many downsides to this. First of all, footpaths could have avoided 90% of injuries and deaths of pedestrians in Goa. Second, it discourages healthy habits like walking and cycling and encourages people to use bikes and cars even for short distances which causes pollution. Third, the onus of safety of pedestrians lies entirely on the pedestrians who are usually the poor or elderly. The Government provides no protection for these Goan who either chose or have no choice but to walk along along the highways in their villages. There are around 21 Institutes for Driving Training & Research in India which are setup by the State Governments including some in collaboration with companies like Maruti Suziki, Ashok Leyland and Tata Motors. The Central Government provides the capital for setting up the institute. The institutes have specially designed training and testing tracks, class room support and other facilities like simulator, eye testing facility, engine room, hostel and canteen. In contrast, in Goa there is no dedicated testing track. The RTO uses roads in less populated parts of the cities as testing tracks. However, once construction activities start in those areas, the RTO will have to look elsewhere for makeshift testing tracks. The driving tests conducted by the RTO are archaic as they provide no evaluation of the driver’s real life driving skills and behaviour, such as whether the driver shows side indicators around 50 meters before approaching the turn , or following speed limit signs or how the driver navigates through traffic. The information submitted to MoTH by 23 states in July 2017 shows that there are 789 identified black spot (accident prone areas) of which 175 were being improved. In this report too, Goa is missing from the list which shows the lack of commitment by the Goa government to identify and mitigate black spots. Speed Governors/limiters are a 20th century solution to a 21st century problem. Due to lack of adequate research and data, the government attributes the cause of accidents primarily on speed. In Goa, the taxi drivers have been opposing the speed governors since they allegedly cause damage to the vehicles, some models of cars have no provisions to install speed governments and cars stand to lose their warranty if speed governors are installed. While speed governors limit the top speed of the vehile to 60 kmph and may even reduce acceleration, they don’t necessarily provide against rash driving seen on Goa’s highways and internal road where accidents are also caused due to overtaking, switching lanes without indicators, driving from internal roads onto main roads without stopping, and abrupt breaking and turning. There is also no research available that proved that road accidents involving light motor vehiles have reduced after installing speed governors. However, in the case of heavy vehicles there are some studies conducted. In kerala, 100 state buses were fitted with speed governors and they found that these buses were involved in fewer accidents as compared to other buses. In addition, they found that fuel efficiency increased by 5kmpl and these buses recorded significantly lower wear and tear. The down side was that these buses NEVER ran on time and the long distance buses were late by an hour. A better option is to install GPS units in the vehicles which track the speed and location of the vehicles. This way, the department can enforce local speed limits of even 50kmph and rash driving. This will also solve the larger problem of enforing routes and timings of local buses. Also, commuters can be given apps to monitor the location of the buses which is a bonus for tourists visiting goa. Why are Goans paying a premium for smart card licenses? The RTO or traffic police has never scanned the chip of anyone’s license. This is a classic example of implementing a technology without a well thought off policy. The traffic sentinels and speed governors in it’s current form will probable meet the same fate. The Government has to go back to the drawing board and come up with a Traffic Safety Policy and an action plan by consulting all stakeholders. Only then can we significantly reduce road accidents.